We invite you to take a self-guided tour through the BambooHR experience. Stop, start, and review at your own pace. 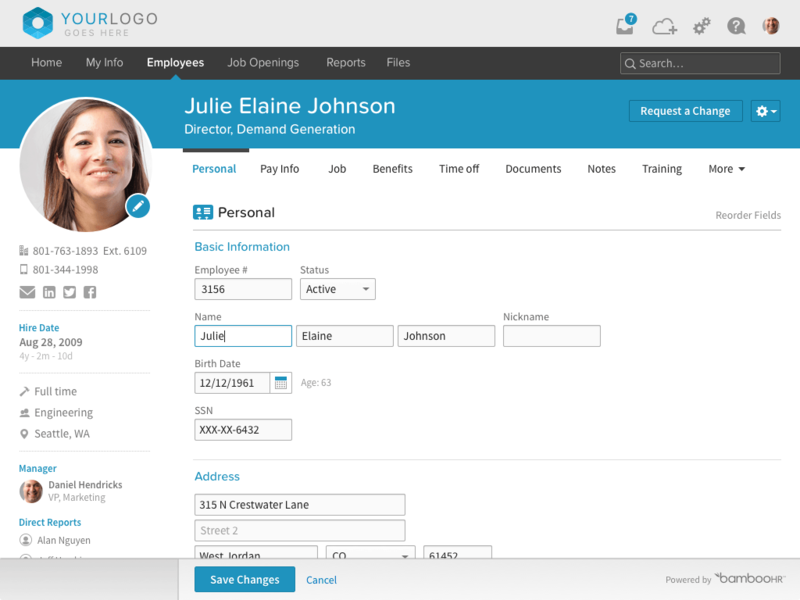 When you're ready for more, just schedule a demo or start your free HR software trial. Explore our beautifully simple (yet thoughtfully powerful) tools that automate operational HR tasks so you can get to the strategic activities and outcomes—like engagement, retention, and job satisfaction—that make a big impact. Just like the bird and its worm, the early HR rep gets the (best) candidate. BambooHR's applicant tracking software helps you keep up with a competitive job market and improve candidate experiences. Post to job boards, easily filter and rate candidates, and leave comments for collaborators. When employees have a stellar first day, you increase retention and engagement. BambooHR's employee self-onboarding software can help you complete paperwork before the new hire's start date and get everyone introduced quickly with welcome emails and team introductions. Goodbye boring, hello brilliant. Be done with time-off requests in emails and on sticky notes. 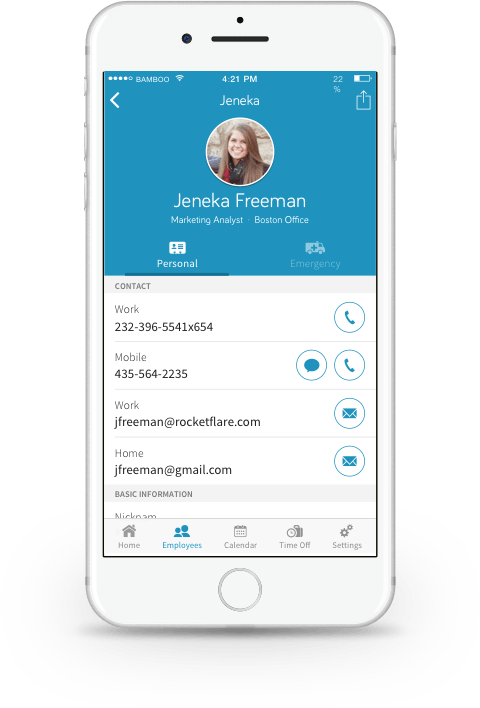 BambooHR handles requests and approvals digitally, then tracks them in convenient calendars and reports. You’ll love being able to create custom time-off policies that accrue automatically, and employees will love using the mobile app to submit requests. Healthcare data for compliance? Check. Contact information for the employee directory? Check. Custom data for everyone’s shirt size and favorite candy bar? Check. Track all employee information accurately in one secure HR database that’s accessible from anywhere. Performance reviews are broken. At least, they were. We fixed a few things like huge time commitments, weak results, and infrequency. Then we added meaningful feedback and better ways to measure performance and engagement. The result? Innovative (dare we say, enjoyable?) employee performance management. Quick. Custom. Precise. BambooHR makes it easy to create detailed reports on almost any data in the system. Be proactive instead of reactive. Analyze data instead of compiling it. Be the strategic HR professional you were meant to be. Create custom workflows to be more efficient in your decision-making processes and protect the integrity of your data. Remove bottlenecks by making approvals easy to manage and even easier to execute, paving the way for your company to grow faster. Remove the hassle of collecting signed paperwork. Electronic signatures streamline processes, making experiences like onboarding and open enrollment more enjoyable while also keeping documents organized and easy to access. Save time by rounding up paperwork, money by ditching filing cabinets, and trees by leaving them alone. There's no substitute for hands-on experience. Try it yourself—free software trial for seven days.